Civil Engineers at Queen’s University Belfast in collaboration with pre-cast concrete specialists Macrete Ireland have developed the world’s longest ‘flat pack’ arch bridge. Based on the ‘FlexiArch’ system, the bridge is unique in that it will be transported to site in flat-pack form but when lifted, will transform under gravity into an arch. The bridge is due to be installed near Portsmouth in coming months and will span 16 metres (53 feet) over the Wallington River in Waterlooville, Hampshire. Made up of 17 units (1m wide) of pre-cast concrete, each weighing 16 tons, the bridge will take less than a day to install using a 200-300 ton crane in association with a lifting beam also designed and built in Northern Ireland. If the alternative of a conventional arch had been utilised it would have taken months to construct and would have been much more costly. A FlexiArch bridge requires little maintenance and should last 300 years, compared to the projected lifespan of up to 120 years that accompanies a conventional bridge. It is the result of 10 years of research from the early 1990s in the School of Civil Engineering at Queen’s University Belfast. Queen’s was recently placed in the Top 10 of research intensive universities in the UK, and Civil and Construction Engineering at Queen’s was ranked third in the UK for research intensity. There are over 50 FlexiArch bridges now in the UK and Ireland, including the three footbridges in parkland surrounding Newtownabbey Council building. Professor Adrian Long, from the School of Planning, Architecture and Civil Engineering at Queen’s University, who patented the FlexiArch concept in 2004, said: “This is a real milestone which has been reached as a result of the hard work, effective collaboration and the combined expertise of the Queen’s and Macrete team. 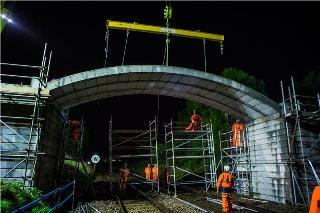 We are delighted with this latest development and of how successful the FlexiArch system has become. Over 50 FlexiArch bridges have now been installed in the UK and Ireland where it has been found to be even more versatile than anticipated. The FlexiArch system has seen continuous investment by Macrete since they were granted exclusive licensing rights for the UK/Ireland in 2006. This plus the additional investment by Invest Northern Ireland has allowed Macrete to provide 70 person years of employment at the company’s headquarters in Toomebridge.